Nintendo's booth at E3 will immerse attendees in the world of the game. "The Legend of Zelda: Breath of the Wild" represents the next great boundary-breaking adventure from Nintendo. The game marks a new pinnacle for the franchise, and on June 14 Nintendo gave the world its first look at the immense, living and breathing world of the Wii U version of the game at the E3 video game trade show in Los Angeles. The game challenges and surprises players at every turn, while giving them incredible freedom to explore the massive world found in this open-air adventure. Nintendo gave fans just a taste of how "The Legend of Zelda: Breath of the Wild" takes the franchise to new heights. Nintendo’s booth at E3 immerses attendees in the world of the game. As E3 attendees investigate Hyrule, they can explore the game any way they want because the world is so vast and players are not required to take a pre-determined path. This sense of freedom and vastness will truly come alive in the final game when the experience isn't limited by the restrictions of a show floor demo. During a "Nintendo Treehouse: Live demo," Nintendo showed that heroic Link needs to be resourceful as he explores his environment. It’s important for players to become familiar with their surroundings so they can find weapons or collect them from defeated enemies. The game breaks with some conventions from the series. For example, many of the minor enemies are no longer scattered randomly around the world, as many now live together in colonies. He can even reach the top of mountains – any mountain he can see, he can climb. He can paraglide to lower areas or even use his shield to slide down a mountain. Link will travel across fields, through forests and to mountain peaks. The game’s wild world surrounds Link, and he must pay attention to changes in climate, as a shift in weather or temperature can affect the environment and his ability to survive in it. A sudden downpour might douse a roaring campfire or a lightning storm might be attracted to Link’s metallic weapons. Players might need to bundle up with warmer clothes or change into something better suited to the desert heat. As players work their way through the traps and puzzles inside, they’ll earn special items and other rewards that will help them on their adventure. Puzzles in the game often have multiple answers, and secrets can be found everywhere. Exploration and discovery are a huge part of the fun. "The Legend of Zelda: Breath of the Wild" is scheduled to launch simultaneously for both the Wii U console and Nintendo’s next system, code-named NX, in 2017. The game also includes compatibility with amiibo, which are sold separately. Nintendo announced a new series of amiibo figures specific to the game that includes Link with a bow (“Archer”), Link on horseback (“Rider”), and a “Guardian” that is the first amiibo with flexible parts. The existing Wolf Link amiibo works with the game as well: When players tap a Wolf Link amiibo to the Wii U GamePad controller, Wolf Link will attack enemies on his own and help players to hunt. He has three hearts, unless players carry over save data from The Legend of Zelda: Twilight Princess HD. Wolf Link disappears when his hearts run out. Details can be found at e3.nintendo.com/amiibo/. 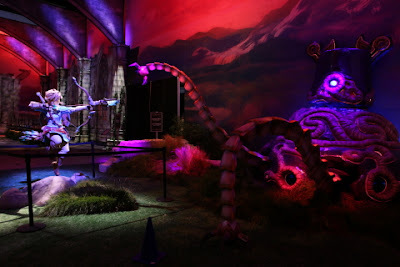 While "The Legend of Zelda: Breath of the Wild" is clearly the star of Nintendo’s presence at E3, "Nintendo Treehouse: Live" also gave Pokémon fans something to go wild about this morning: the world premiere of live gameplay from "Pokémon Sun" and "Pokémon Moon," the seventh, and newest, era of the core Pokémon series. The games*, made for the Nintendo 3DS family of systems, include new Pokémon, a new Pokédex, a new region and a new battle format to enhance the Pokémon experience in almost every way. In the Pokémon Sun and Pokémon Moon games, players embark on a new adventure as a Pokémon Trainer. They catch, battle and trade new Pokémon characters on the tropical islands of the Alola Region, which is comprised of four islands rich in natural beauty and an artificial island. "Pokémon Sun" and "Pokémon Moon" launch Nov. 18. More information on the games can be found at Pokemon.com/SunMoon, and a video showing today’s reveal can be found at YouTube.com/Pokemon. Anyone who wants to keep tabs on Nintendo’s activities at E3 from afar can keep an eye on "Nintendo Treehouse: Live" at http://e3.nintendo.com, or on Nintendo’s YouTube or Twitch channels. The remainder of today’s show will be dedicated to "The Legend of Zelda: Breath of the Wild." The final day of "Nintendo Treehouse: Live" begins at 10 a.m. PT on June 15, and will primarily offer a showcase of previously announced Wii U and Nintendo 3DS games, including "Tokyo Mirage" Sessions #FE (June 24), "Monster Hunter Generations" from Capcom (July 15), "Paper Mario: Color Splash" (Oct. 7) and "Dragon Quest VII: Fragments of the Forgotten Past" (2016). Additionally, viewers will get their first look at a new Mario Party game for Nintendo 3DS that includes additions and changes to make it much more fast-paced and portable-friendly – players no longer have to wait for their turn, as everyone moves at once. Mario Party Star Rush launches Nov. 4. Also on Nov. 4, Nintendo will launch new amiibo in the Super Mario series. The collection will feature the debut of amiibo figures for Daisy, Waluigi and Boo – and the Boo amiibo figure glows in the dark. The collection also introduces new poses for Wario, Rosalina, Donkey Kong and Diddy Kong. As a special treat for fans, Nintendo eShop is offering discounts of up to 40 percent for some of its most popular games between 11 a.m. PT on June 14 and 8:59 a.m. PT on June 21. Even better, My Nintendo members who have signed in, linked their Nintendo Network IDs and visited Nintendo eShop at least once before purchase get an extra 10 percent off the already-discounted price on select titles. Discounts have been applied to dozens of games, including multiple games in The Legend of Zelda and Pokémon series, as well as a number of Virtual Console games. For a full list of games, more information about the sale and the ability to purchase the games directly from the website, please visit e3.nintendo.com/sale. My Nintendo members will find some new website missions related to The Legend of Zelda at my.nintendo.com/missions. For a limited time, My Nintendo members who sign in are challenged to explore Nintendo’s E3 website to find items that will earn them My Nintendo points. To see details about all of Nintendo’s activities at E3, visit e3.nintendo.com. Remember that Wii U and Nintendo 3DS feature parental controls that let adults manage the content their children can access. For more information about this and other features, visit nintendo.com/wiiu or nintendo.com/3ds. The worldwide pioneer in the creation of interactive entertainment, Nintendo Co., Ltd., of Kyoto, Japan, manufactures and markets hardware and software for its Wii U™ and Wii™ home consoles, and Nintendo 3DS™ and Nintendo DS™ families of portable systems. Since 1983, when it launched the Nintendo Entertainment System™, Nintendo has sold more than 4.4 billion video games and more than 693 million hardware units globally, including the current-generation Wii U, Nintendo 3DS and Nintendo 3DS XL, as well as the Game Boy™, Game Boy Advance, Nintendo DS, Nintendo DSi™ and Nintendo DSi XL™, Super NES™, Nintendo 64™, Nintendo GameCube™ and Wii systems. It has also created industry icons that have become well-known, household names such as Mario™, Donkey Kong™, Metroid™, Zelda™ and Pokémon™. A wholly owned subsidiary, Nintendo of America Inc., based in Redmond, Wash., serves as headquarters for Nintendo’s operations in the Western Hemisphere. For more information about Nintendo, please visit the company’s website at nintendo.com. The Pokémon Company International, a subsidiary of The Pokémon Company in Japan, manages the property outside of Asia and is responsible for brand management, licensing, marketing, the Pokémon Trading Card Game, the animated TV series, home entertainment, and the official Pokémon website. Pokémon was launched in Japan in 1996 and today is one of the most popular children’s entertainment properties in the world. For more information, visit pokemon.com.